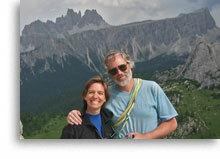 Alpine Adventures is a small, family-owned and operated company; founded by R.L. and Karen Stolz. We are devoted to providing an exceptional level of personal service and only the highest quality instruction and guiding. Our Services reflect this commitment and each program is designed and implemented with that in mind. Alpine Adventures is the most experienced mountain guiding company in the Adirondack Mountains and, on a consistent basis, more than 90% of our business comes from repeat customers. To find out more about the development of Alpine Adventures, please visit our Company History page. R.L. 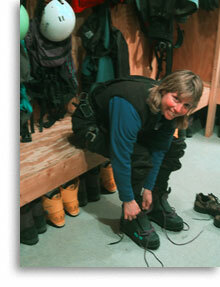 and Karen Stolz are career mountain guides, each with more than 25 years of climbing, skiing and guiding experience. We have both climbed and guided throughout the world  in North and South America, Europe, Asia and Australia. To find out much more about our extensive experience and credentials, please visit the Our Qualifications page. We are based in Keene, New York in the Adirondack Mountains  the east’s largest wilderness. This is where we maintain our offices and our home. It is also the location of our Alpenhaus, which contains a classroom and indoor climbing wall as well as storage and maintenance facilities for equipment. 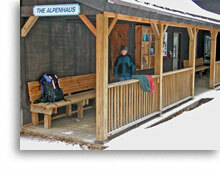 The Alpenhaus serves as the meeting place for our programs, a warm, dry place for instruction when the weather turns nasty, and a general base for our operations. The Adirondack Mountains are a vast resource for climbing and skiing (as well as other activities) and it is here that all of our instructional programs and much of our guiding takes place. With six million acres, there’s plenty of room! To learn more please visit our About The Adirondacks page. We also conduct private trips, for qualified individuals, to a variety of destinations throughout the world. Each of these adventures is custom crafted for the participants. You can learn more about these trips in the guiding section for each of our activities.